Is Kellyanne Conway the No. 1 Leaker? RUSH: There’s a new book coming out by Ron Kessler. We’ve interviewed him for The Limbaugh Letter. He’s a former New York Times reporter. Written a bunch of stuff, anti-Clinton. He’s got a solid, credible reputation. He claims that the number one leaker in the Trump White House is Kellyanne Conway. Kellyanne Conway? The number one leaker in the White House? You know who’s denying this? The Drive-By Media. All these reporters at the New York Times and Washington Post who get all the leaks, “No, no, no, no, no, no, it’s not her.” You would expect them to protect her, granted, if she were. They wouldn’t run around and confirm it, but they’re actively denying it, and I guarantee you, it hits everybody from left field. Kellyanne Conway? Who knew? I mean, for this to be true, Kellyanne Conway would have to be somebody who doesn’t want anybody else getting as close to Trump as she is. I mean, that would be one of the reasons for leaking things is to put other people in trouble, make yourself tighter with Trump, if you can protect yourself as the leaker. She’s also in line to replace Hope Hicks as the new comms director in the White House, if there’s even gonna be one. But I saw that, and I said the last person in the world I would ever associate with leaking anything and undermining Trump would be Kellyanne Conway. I mean, the word on the leaker was it was Bannon. I can’t tell you how many people think it was Bannon, not just me. In fact, I only think it because I’ve been told by people who do claim to know. And nobody has ever, ever in all of the discussion of these leaks ever since Trump was immaculated, I’ve never heard anybody toss her name around. Now here it is in Ron Kessler’s book. Now, her husband, George Conway, George Conway apparently doesn’t like Trump, and George Conway has been retweeting a bunch of anti-Trump tweets. And of course this is supposed look bad for Kellyanne Conway, because what does Hillary say? Women are being forced to vote the way their husbands vote. Women are not their own people. Their brothers, their husbands are ridiculing them, forcing them, making them vote against Hillary. Well, here you have the antithesis of that. You got Kellyanne Conway, worked for Trump, her husband doesn’t like Trump. 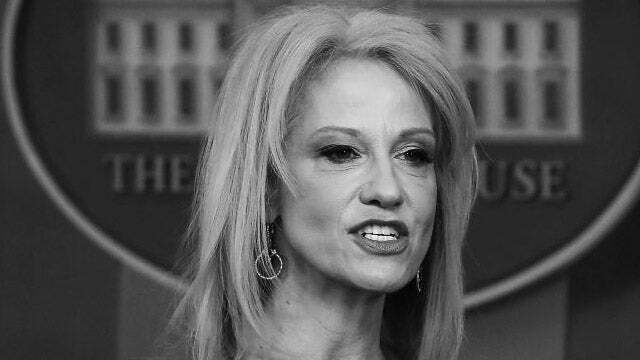 And if Hillary’s theory is right, that means that Kellyanne Conway should be forced to quit Trump and not work for him. But rather than people praising the independence of the marriage, hey, here’s George Conway, can run out there and retweet a bunch of anti-Trump stuff and his wife works for Trump, and she doesn’t try to get him to shut up and he’s not trying to get her to quit. Isn’t that the modern definition of a solid marriage where two people can exist as independents and be healthy and yet still be in love in a relationship? You would think that’s how the left would look at it. But the left is saying something’s wrong here in paradise. And the fact that George Conway is retweeting a bunch of anti-Trump stuff is supposedly giving credence to the fact that Kellyanne Conway might be a secret leaker against Trump because of course women cannot stand up to their husbands. Certainly not. Hillary’s saying so.